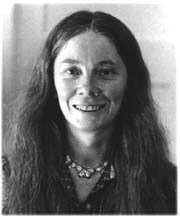 To call Susan Grant of Northampton a renaissance woman does not do her justice. In addition to collecting and sometimes composing folk songs, Sue is a professor of biology sciences at Holyoke Community College and author of Beauty and the Beast -- The Coevolution of Plants and Animals. She has also written mystery novels and a children's book. On the domestic front, she excels at knitting and vegetarian cooking, and with her husband, Don, has home-schooled their teenage daughter, April. And even a Thanksgiving feast. There's nothing like Shutesbury town. Have you ever visited Shutesbury? There's lots there for lumbermen to do. Of famous old Shutesbury town. And the floodwater rose far and near. Stands the center of Shutesbury town. Where he sat down to rest and to pray. And Shutesbury reminds me of home." In hunting the buck and the doe. But without a dead deer on the hood. In search of the jobs they find there. There's no place like Shutesbury still.